Abraham Lincoln was the 16th President of the United States from March 4, 1861 to April 15, 1865. He was born on February 12, 1809 in Hardin County, Kentucky. 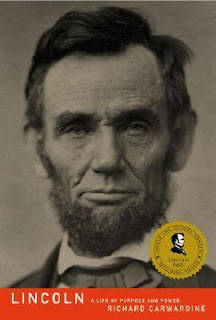 He died, only 56 years old, on April 15, 1865 in Washington, D.C.
Click here for books and other materials on Abraham Lincoln in our library collection divided by subject headings. Explore an online daily account of Abraham Lincoln's life. Other interesting websites on Abraham Lincoln can be found here. Lincoln's house in Springfield, Illinois, in Winter. Charles Dickens - 200th Birthday! And the Oscars go to ... books!